SU Podium and more > Categories > Main Messages Board > Does Podium support vertex colours? I'm looking at investing in some of the incredible realistic plant models by 3dmk Treeline. They are set up for using Vray, and indicate that if using another render engine make sure it supports vertex colours. No, Podium doesn't. 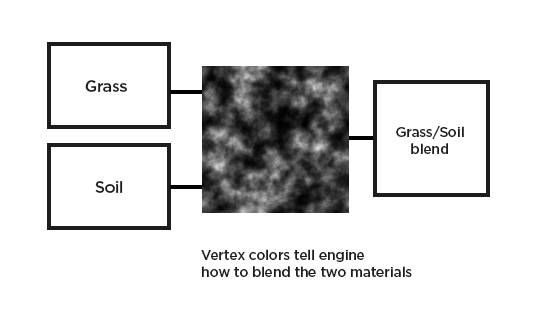 Vertex colors are typically used for blending multiple maps and materials to get added variation and complexity from a limited number of assets. Most node-based material systems would support it -- the UE4 landscape system uses it really well. It looks like 3dmk Treeline is using it for custom variation in leaves and vegetation. Then a third texture drives the vertex colors, and tells the engine where the grass should be visible and where the soil should be visible. With Podium there is no material blending. You would have to manually blend the grass and soil texture in an external editor and then paint the combined map on the SketchUp surface. But Podium can't interpret vertex colors the way a node based system would. The FBX versions of their plants still might be very nice -- you just wouldn't be able to use that particular feature for customization. Thanks so much for getting back to me with such an excellent explanation. Clearly your knowledge is extensive. Where does one learn this kind of stuff?